We've finally worked our way through most of the nifty sites we saw in June on our weeklong swing through New England, so beginning this week we'll turn our attention to the opposite coast, as we recap some of the highlights of a late-July visit to northern California, our first visit there in several years. 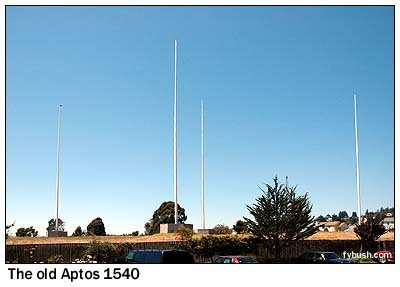 In this week's installment, we'll make some quick drive-by visits to a few sites that, for whatever reason, we didn't get a chance to visit in more detail, beginning with what's arguably the very best AM signal in San Francisco. Today, KNBR (680) is owned by Susquehanna, but for most of this station's existence, it was the West Coast flagship of NBC, not to mention one of the city's oldest radio stations. Under its original calls of KPO, the station began as the radio voice of the Hale Brothers department store, gradually increasing power from 50 to 5,000 watts. 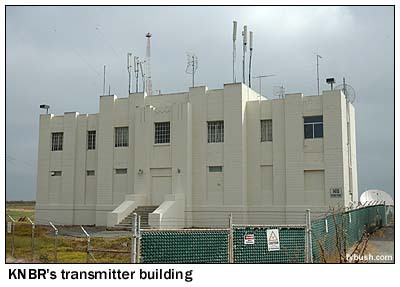 In 1932, the station was leased out to NBC (which would soon buy it outright), and in 1933 KPO built this site in Belmont, on the eastern shore of the peninsula south of San Francisco. 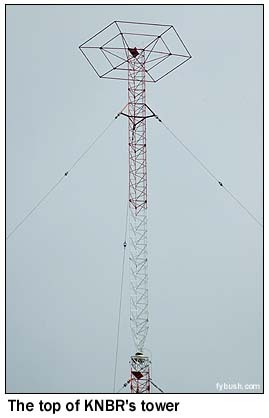 The original installation used two self-supporting towers with a wire antenna strung between them, and I'm nearly certain that what's now the KNBR auxiliary tower, seen at right in the photo above, is one of those two towers. In 1949, the station (by now using the calls KNBC) replaced one of the old towers with a 550-foot guyed tower, the same one that's still in use 56 years later as the main tower. This is a most interesting tower for several reasons: first, it's unusually short for a class I station on 680 (KPO was initially a class I-A facility, but was broken down to a de facto I-B when additional fulltime stations on 680 were authorized in North Carolina and Massachusetts after the war), and second, because it's got an insulator about two-thirds of the way up the tower. Yes, it's a sectionalized tower - and one with a top hat on the upper section, to boot, to give the tower a little more electrical height in lieu of the physical height it couldn't achieve because of the nearby San Francisco International Airport. 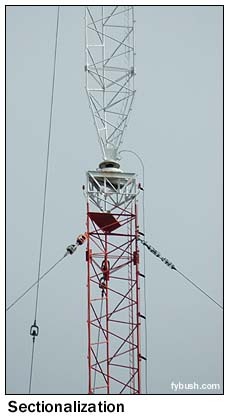 The story goes that when the tower was being put into service in 1949, NBC stationed an engineer in Seattle, connected by telephone to the transmitter site, to take field-strength measurements of KNBC's skywave signal and to allow the engineers back in Belmont to achieve the maximum skywave from this site. Indeed, it delivers a monster signal across most of the west at night, despite subsequent retunings aimed at improving the groundwave signal in the Bay Area at the expense of the skywave. KNBR has used its present calls since 1960, when the KNBC calls were moved south to NBC's Los Angeles TV station. It's been a sports talker since the late eighties, when NBC sold its radio operations and the station passed first to Emmis and then to Susquehanna. 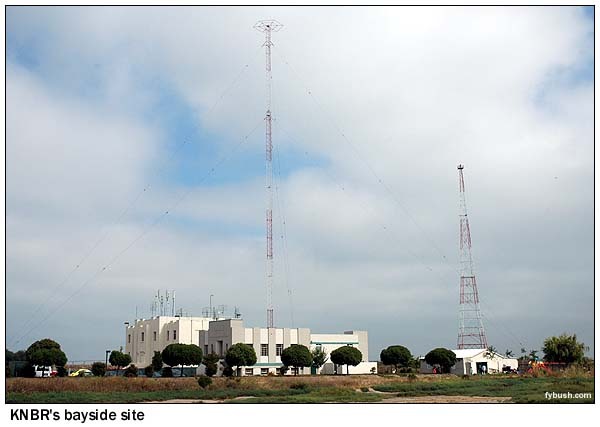 For most of that time, KPO/KNBC/KNBR had company out here on the edge of the bay, in the form of the shortwave station that signed on next door in 1941. Originally owned by General Electric, the station used calls that included KGEI. After the war, this was one of just two shortwave stations that returned to private operation (the other was WRUL in Scituate, Mass. 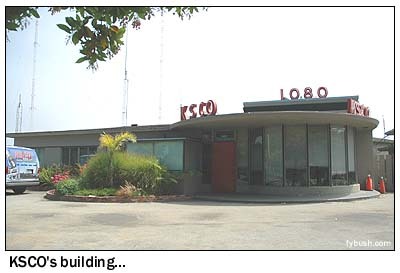 ), and for a half-century KGEI broadcast programming to South America and Asia from this site at Redwood Shores. In 1995, Far East Broadcasting Company closed the "Friendship Station," and today the antennas are gone and the building (seen in the foreground in the photo at the top of the page) is used by a church. And we close off our little "nobody home" jaunt this week with a site where there's literally nobody home - not even a licensed station. Ten miles or so to the east of KSCO, right alongside coastal Highway 1 near Aptos, sits one of the more unusual directional arrays out there. These four aluminum towers look more like flagpoles, and it's my recollection that at one time, years ago, they even had flags flying from them. 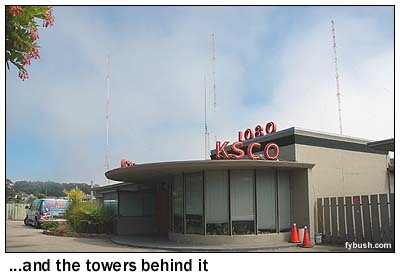 Back then, these towers were home to KMBY, operating on 1540 and licensed to Capitola, California. It had a pretty good signal - 10 kilowatts day and night - and that, ironically, is part of the reason it's no longer on the air. In 1998, KMBY went silent, its license deleted at the behest of Westinghouse (later Infinity), which struck a deal to take 1540 off the air to enable a dramatic signal upgrade to what was then KPIX on 1550 in San Francisco. It was to have moved to the South Bay, with a new transmitter site in Milpitas cranking out 50 kilowatts. NIMBY issues have prevented that upgrade from taking place, but that didn't make 1540 down here any less dead, and so for almost eight years these towers have been sitting silently between a hotel parking lot and a golf course. JUST RELEASED - it's your very first chance to order the 2006 Tower Site Calendar! Click here for ordering information!